To date, PNP scientists have conducted over 400 individual studies in various animal models documenting the performance characteristics and validity of PNP's therapeutic approach. Most prominent amongst these are studies demonstrating therapeutic efficacy and the fact that only a small percentage of the total volume of tumor cells need be transfected to achieve significant reductions in tumor volume; the so-called "bystander effect". In the experiment shown below, mice bearing D54 flank tumors in which 2.5%, 5%, or 10% of the tumor cells express E. coli PNP were treated with F-araAMP. 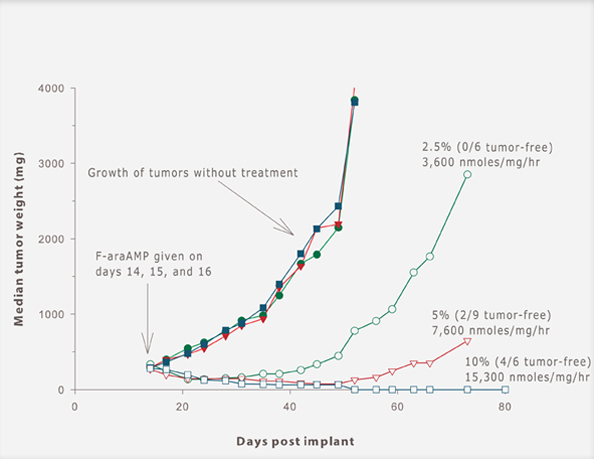 F-araAMP is not effective against D54 tumors that do not express E. coli PNP (data not shown). Three days of treatment with F-araAMP resulted in excellent activity against D54 tumors in which as few as 2.5 % of the cells expressed E. coli PNP, and F-araAMP was able to cure mice of tumors in which 10% of the cells expressed E. coli PNP. These results indicate that excellent activity can be obtained with F-araAMP even when a small fraction of the tumor cells express E. coli PNP. Another innovative aspect of this approach is related to the mechanism of action of fluoroadenine, which is quite different than that of all other existing and experimental anticancer agents, including the other suicide gene therapy strategies, such as HSV thymidine kinase and bacterial cytosine deaminase. We have shown that fluoroadenine is converted to an analog of ATP, which disrupts enzymes involved in RNA and protein synthesis, two functions important to cellular metabolism regardless of the proliferative status of the cell (dividing versus quiescent). Targeting of RNA and protein synthesis with fluoroadenine based therapy for the treatment of cancer is only feasible in conjunction with gene therapy strategies, because there is no selectivity inherent in the cell killing action of fluoroadenine; i.e., the selectivity of this approach is due to the selective generation of fluoroadenine in the tumor mass. The properties of fluoroadenine confer unique advantages in the treatment of solid tumors and are precisely those that are required to kill refractory tumor cells in patients (high potency, high diffusion rate, and activity against non-proliferating cells).